IBS - or irritable bowel syndrome - is a common skin condition in the UK and can trigger symptoms such as tummy pain, bloating and excessive wind. It is one of a number of chronic health issues involving the bowel, including Crohn’s disease and colitis, that affect 300,000 people in the UK. 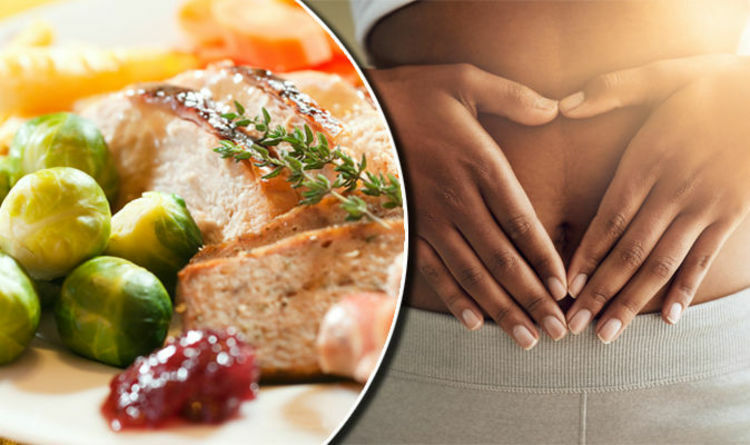 While 40 per cent of the population have at least one digestive issue at any one moment, for those with a bowel condition navigating Christmas can be a minefield. Enjoying the festive season while keeping symptoms at bay can leave sufferers feeling anxious and isolated. Bowel and Cancer Research have joined forces with nutritionist Lily Soutter to provide advice on how people can look after their gut health throughout December. “Over-eating, especially with high fat meals can be a common trigger for digestive complaints,” explained Soutter. “Set yourself up for success by having a healthy yet hearty breakfast that includes protein to keep you satisfied and less likely to snack. She recommended scrambled eggs with tomatoes, porridge topped with seeds and natural yoghurt served with fresh fruit for breakfast. “Most people like to indulge in an alcoholic drink, especially at Christmas,” acknowledged Soutter. However, she points out this needn’t cause a problem. “Although it’s clear that alcohol can be a digestive irritant, research suggests that light drinking - one a day - shouldn’t affect your digestive health. “Binge drinking - four or more per day - however, may lead to digestive upset and isn’t advised for your health. Soutter explained that ‘one drink’ refers to one regular beer, one small glass of wine or one shot of spirit. She suggested a white wine spritzer, or a vodka or gin with sparkling water and a squeeze of fresh lemon or line. “Lots of people have learnt this the hard way, but, don’t drink alcohol on an empty stomach!” warned Soutter. “Try consuming a small meal or snack before Christmas parties to line your stomach and also experiment with homemade healthy canapés. “We have trillions of bacteria within our gut, our microbiome,” explained Soutter. “In fact, they weigh around 2kg, which is the same weight two as two bags of Brussels sprouts! However, Brussel sprouts, cabbage and parsnips are rich in prebiotic fibre - so load up. “Research suggests that regular consumption of fermented foods which are rich in ‘good bacteria’ may help support digestive health,” said Soutter. She suggested serving up sauerkraut, live yoghurt, pickles and kefir. “During the winter months, there is a tendency to gravitate towards carb-heavy, high-calorie meals to make us feel warm and cosy,” said Soutter. “Don’t worry, I’m not asking you to cut carbs completely but opt for the carbs that have added health benefits. “Wholegrains, winter vegetables, pulses, beans and fresh fruit and healthy carbohydrates and a rich source of fibre. “Many of us in the UK are currently only consuming half our recommended fibre intake but it’s such an important component for healthy digestion.